Does the story of Moses come before or after David, in the Bible? Was Paul around at the same time as Jesus? When did Daniel meet the lions? Did you have to think for a moment? It's not always easy because, for most of us, Bible reading, teaching or sermons happen piecemeal - a verse here, a chapter there, maybe a complete letter or a short book. So it is not surprising that we find it hard to work out where all the stories and characters belong and what part they play in working out God's great plan of salvation for the world. "The Big Bible Storybook Timeline" is here to help you see God's big story in its historical order. With a combination of colour illustrations, a list of key dates and brief, explanatory text, the "Big Bible Storybook Timeline" provides an instant visual aid for everyone who wants to know what happened when, and who came first. 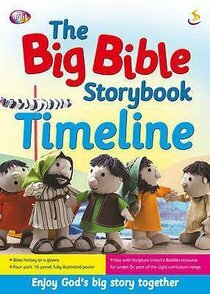 "The Big Bible Storybook Timeline" can be used in any early years setting: church-based children's groups, carer and toddler groups, nurseries, schools and in your own home. It is designed to work alongside 'Bubbles', Scripture Union's curriculum resource for children aged 5 and under but can also be used as a standalone resource. This work includes: four-part illustrated "Big Bible Storybook Timeline" poster with adhesive strips, ready to be joined together, and How to use your "Big Bible Storybook Timeline": activities to use with children. - Publisher Does the story of Moses come before or after David, in the Bible? Was Paul around at the same time as Jesus? When did Daniel meet the lions? Did you have to think for a moment? It's not always easy because, for most of us, Bible reading, teaching or sermons happen piecemeal - a verse here, a chapter there, maybe a complete letter or a short book. So it is not surprising that we find it hard to work out where all the stories and characters belong and what part they play in working out God's great plan of salvation for the world. "The Big Bible Storybook Timeline" is here to help you see God's big story in its historical order. With a combination of colour illustrations, a list of key dates and brief, explanatory text, the "Big Bible Storybook Timeline" provides an instant visual aid for everyone who wants to know what happened when, and who came first. "The Big Bible Storybook Timeline" can be used in any early years setting: church-based children's groups, carer and toddler groups, nurseries, schools and in your own home. It is designed to work alongside 'Bubbles', Scripture Union's curriculum resource for children aged 5 and under but can also be used as a standalone resource.This work includes: four-part illustrated "Big Bible Storybook Timeline" poster with adhesive strips, ready to be joined together, and How to use your "Big Bible Storybook Timeline": activities to use with children. About "The Big Bible Storybook Timeline"
Does the story of Moses come before or after David, in the Bible? Was Paul around at the same time as Jesus? When did Daniel meet the lions? Did you have to think for a moment? It's not always easy because, for most of us, Bible reading, teaching or sermons happen piecemeal - a verse here, a chapter there, maybe a complete letter or a short book. So it is not surprising that we find it hard to work out where all the stories and characters belong and what part they play in working out God's great plan of salvation for the world. "The Big Bible Storybook Timeline" is here to help you see God's big story in its historical order. With a combination of colour illustrations, a list of key dates and brief, explanatory text, the "Big Bible Storybook Timeline" provides an instant visual aid for everyone who wants to know what happened when, and who came first. "The Big Bible Storybook Timeline" can be used in any early years setting: church-based children's groups, carer and toddler groups, nurseries, schools and in your own home. It is designed to work alongside 'Bubbles', Scripture Union's curriculum resource for children aged 5 and under but can also be used as a standalone resource.This work includes: four-part illustrated "Big Bible Storybook Timeline" poster with adhesive strips, ready to be joined together, and How to use your "Big Bible Storybook Timeline": activities to use with children.